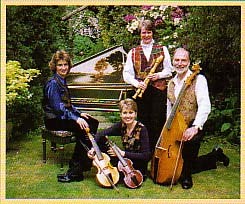 Stromenti, elegant harpsichord lead Baroque ensemble. Exciting and charming music to suit different occasions, played on variety of authentic period instruments. – Elegant and evocative background music for a wedding, reception or other special occassion. – Music to fit a historical setting – stately home or museum – formal or informal. – Music in a variety of musical styles – English, French, German, Italian – from the 17th and 18th centuries – chosen to delight a broad range of tastes. Stromenti is a four-piece Baroque ensemble playing on a variety of authentic period instruments, providing a wide range of exciting and charming music to suit different occassions. Over the rich and sonorous harmony of harpsichord and viola da gamba, melodies are played by different combinations of recorder, voice flute, pardessus de viole and viola da gamba. For appropriate occassions, Stromenti can also provide songs for soprano with various combinations of instruments. Jacqui Robertson is a graduate of Trinity College of Music in cello and viola da gamba. She studied the viola da gamba with Edgar Hunt,David Hatcher and Alison Crum. She has performed extensively in the South East and the Midlands, and on tour in Belgium and Ireland, with groups including Leamington Baroque, Brentwood Baroque, Warwickshire Waits, Saltarello, Pianelle and Stromenti. She sings with Circle Singers of Royal Leamington Spa. She teaches the Baroque and Classical cello and the viola da gamba and regularly devises and gives concerts and educational workshops on period instruments in schools. She has established children’s viol consorts for the Couty Music Service in Warwickshire. She has much experience of playing for Baroque and Renaissance. Alsin Bowler studied music at Dartington College of Arts and later at the Guildhall School of Music where she qualified as a music therapist. She studied harpsichord with Maggie Cole. A change of career took her to the BBC where she worked as an assistant music producer for schools programmes. She performs with various groups in the South East, including Background Baroque and Stromenti. She teaches piano and regularly works as an accompanist in festivals and examinations. Judy Deats is a graduate of Exeter University. She studied vocal technique with Ashley Stafford and Baroque and Renaissance performance on the recorder at many specialist short courses directed by Philip Thorby. She has performed with the BBC Symphony Chorus, Wooburn Singers (including concert tours in Paris, Prague and Venice), Windsor Festival, Lord Leycesters Consort, Leamington Baroque, Background Baroque and Stromenti. Roger Deats is a graduate of Exeter University and the OU. He studied viola da gamba with Alison Crum, recorder with Walter Bergmann, and Baroque music technique on many specialist short courses. He has performed extensively in the South East and the Midlands with a variety of groups including Musick’s Monument, Contretemps, Timedance, Saltarello, Leamington Baroque, Background Baroque, Stromenti and Pianelle. He sings in Lod Leycesters Consort and with the Wooburn Singers (including tours in Paris, Prague and Venice). He also has much experience of devising and producing original concert programmes for ensembles from duo to chamber orchestra and considerable experience of playing for Baroque and Renaissance dance, including performances in the Edinburgh Festival and in Berlin.